FAMILIES will be whisked away on an adventure in Neverland this Christmas as Peter Pan flies into the New Theatre Royal. 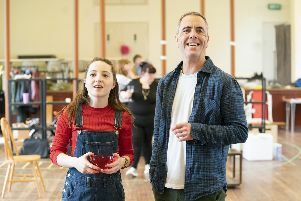 The city centre theatre is putting on a brand new adaptation of the JM Barrie classic about the boy who wouldn’t grow up, which has been written by its chief executive Scott Ramsay. Sam Bailey, from Wivenhoe in Essex, is taking on the title role. The 25-year-old: I did Peter Pan two years ago in Skegness, so I am familiar with the iconic character. But that was the only other Christmas show I've ever done. But i t will be the first ever Christmas show for Hannah McIver, from Manchester, who is playing Wendy Darling, and only graduated from Guildhall School of Acting this summer. Over the summer she made her professional debut in a new musical romantic comedy, It Happened in Key West, at the Charing Cross Theatre in London. ‘I’m very excited to be spending my Christmas in Portsmouth, said the 21-year-old. Ariane Barnes has been more used to improvisation lately as a cast member of the hit comedy Showstoppers. But in this show, she plays Tiger Lily, princess of the Piccaninny tribe, who live in Neverland. Ariane, who is British-Mauritian added: ‘As a BAME actor, I think it’s amazing that she’s been reimagined like this and holds a strong part in the show. I love the presence and command that she’s been given. Timothy Lucas makes a welcome return to the NTR, after wowing audiences in last Christmas’s Beauty and The Beast as the devious Frederick. This time he’s the dastardly Captain Hook. And as for his co-star and soon-to-be-neme sis Sam? ‘I hate him already,’ he laughed. Peter Pan is at New Theatre Royal in Guildhall Walk, Portsmouth, from December 13 to 31. Tickets cost £10 to £26 depending on time and day. Family and VIP tickets also available. Go to newtheatreroyal.com.